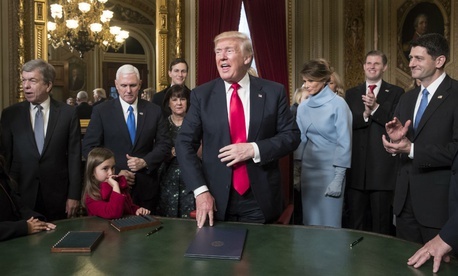 Eighty days into his presidency, Donald Trump’s pace at naming key officials lags that of previous administration’s by a month and is “on track for the worse performance in three decades,” according to a count by academics at the White House Transition Project. The transition project, which since 1999 has tracked all modern administration handovers and offered nonpartisan guidance, is run by Terry Sullivan, a political scientist at the University of North Carolina at Chapel Hill, and Martha Joynt Kumar, emeritus professor of political science at Towson University. Their latest numbers, updated as of April 10, reinforce a slow hiring pace documented by the presidential appointments tracker maintained by the Washington Post and the nonprofit Partnership for Public Service. Of 553 key positions requiring Senate confirmation, the Trump team so far has named no nominee for 478. As of Tuesday, only 22 nominees had been confirmed. The reasons, according to news reports, including a Monday analysis from Politico, appear to be a combination of delays in vetting candidates, Trump’s stated belief that some of the positions don’t need to be filled, turf wars among advisers and demands for personal loyalty that may have turned off some candidates. “Trump personally oversees the hiring process for agency staff by insisting on combing through a binder full of names each week and likes to sign off on each one,” Politico reported, giving the transition team originally led by New Jersey Gov. Chris Christie credit for preparing several names for each key position. Trump, however, often announced names before the individual had been vetted by the FBI and the Office of Government Ethics, which alone can take up to 60 days to review candidates’ background. The White House now has a 38-person staff working under seven managers reporting to Director of White House Personnel John DeStefano. That office’s vetting of nominees “follows the patterns of previous administrations but takes some 10 days longer than the average schedule” for appointments, according to the White House Transition Project. The academics track 970 presidential appointments requiring confirmation, including those for key ambassadorships, independent regulatory agencies, boards and commissions. It tracks the pace of vetting in both the executive branch and the Senate, as well as the degree to which the administration has promptly filled critical national security jobs. The analysts then compare the current administration with recent predecessors, including detailing a specially focused comparison between appointments made by the Trump and Obama administrations. “President Obama did far better in securing critical leadership than has President Trump so far,” the scholars wrote. “On the most critical leadership positions and by this time, President Obama had filled 58 of the 221” used to compare the two administrations, versus 42 by Trump (though 25, or more than half) were already in place on Inauguration Day. “By now, President Obama and the Senate had filled [several central positions] “which currently remain completely empty,” the report said, among them Defense undersecretary for intelligence, deputy attorney general, deputy secretary of State and head of the Securities and Exchange Commission.